I am trying to root my Xiaom mi a2 phone. But i am stuck on changing the active partition. When i enter "fastboot set_active b" it doesnt execute the command. Instead i get a list off all available commands which doesnt contain an option to change the active partition. Now i was able to set the active partition and install the root. I got no errors and everything seemed fine but i still had no root access. I found this tutorial: guide-how-to-root-xiaomi-mi-a2-magisk and it worked for me. be done on the slot specified. to the current active slot. Well, the fastboot you are using is outdated. You need to install the latest platform-tools from Android SDK which has the latest fastboot binaries. This link will always give you the latest ADB & fastboot for Windows. For more information, here is how to install ADB and fastboot on Windows. Not the answer you're looking for? Browse other questions tagged adb root-access fastboot xiaomi or ask your own question. adb option like fastboot -i <vendorid>? 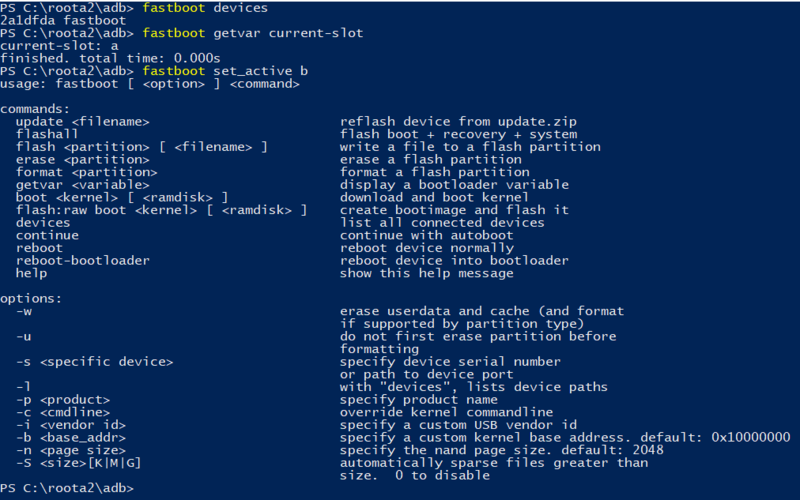 What fastboot erase actually does?